Visible satellite image of Typhoon 08W around 8 p.m. EDT on July 13, 2011. As expected atmospheric conditions have improved and Tropical Storm 08W strengthened into a Typhoon yesterday. As of 00z July 14 (8 p.m. EDT July 13), Typhoon 08W (MA-ON) had maximum sustained winds of 90 knots (105 mph), making it a Category 2 Typhoon. From the visible satellite image above, you can see an eye has formed in the center of the typhoon. The storm is really getting its act together as a result of warm sea surface temperatures and a ridge of high pressure in place. Both are excellent conditions for brewing a strong typhoon (or “hurricane” if we were talking about an Atlantic Ocean storm). Also evident in the image above is one very well defined outflow band which expands in a semi-circle across most of the northern half of the typhoon, well outside of the center. This banding feature is indicative of a ridge of high pressure aloft as well as increasing organization of the typhoon. 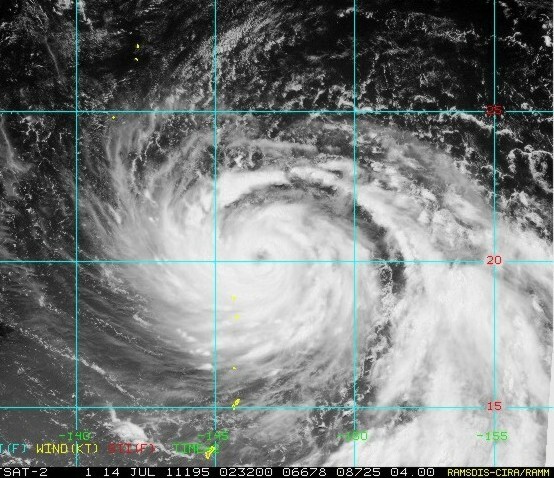 Typically, when an outflow band is this well structured the typhoon is rapidly strengthening, or is organizing in a way that will soon lead to rapid intensification. Based on the favorable oceanic and atmospheric conditions as well as the visible satellite clues, it’s no surprise that the Joint Typhoon Warning Center is forecasting Typhoon 08W to strengthen over the next 24 hours. In fact they are forecasting some rapid strengthening over the next 36 to 72 hours and expect Typhoon 08W to become a strong Category 4 Typhoon by the weekend. As the typhoon curves northwest towards Japan on Monday and Tuesday (July 18/19), they are forecasting some weakening due to increased wind shear. But from their intensity forecast and their discussion, it looks like they believe the typhoon may only weaken to a weak Category 3 typhoon, with 100 knot (115 mph) maximum sustained winds as it comes very close to or has a direct impact on Japan mid next week. 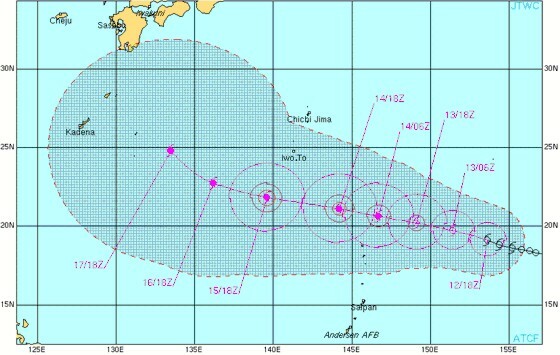 Track forecast for Typhoon 08W created at 8 p.m. EDT July 13, 2011. 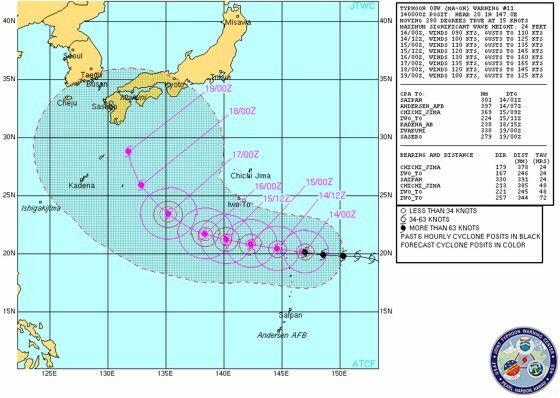 Residents in Japan — especially southern Japan — should monitor this typhoon closely over the next several days. Even though the Atlantic hurricane season is quiet right now, that doesn’t mean the tropics all across the globe are quiet. 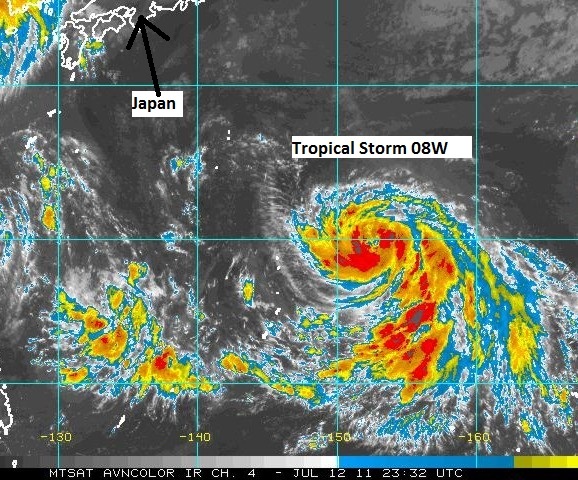 Today, Tropical Storm 08W formed over the western Pacific Ocean. Water temperatures are warm and wind shear is weak. 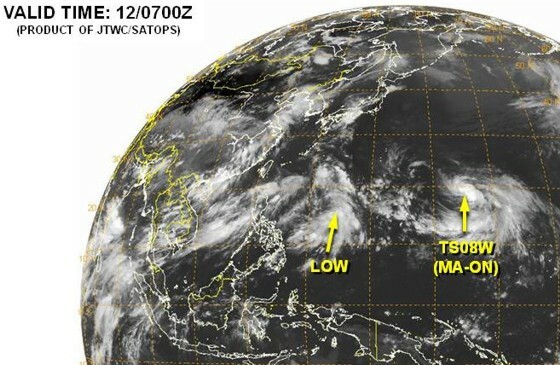 Other atmospheric conditions are expected to be favorable for strengthening over the next several days as the storm moves west-northwest across the western Pacific. As a result, the Joint Typhoon Warning Center is forecasting maximum sustained winds to reach 95 knots (around 110 mph) this weekend as the storm begins to turn more towards the northwest in the general direction of Japan. That intensity would be considered a strong Category 2 Hurricane on the Saffir-Simpson scale if this storm was located in the Atlantic Ocean. Computer models are indicating this storm will turn northward to very close to the coast of Japan early next week. How close the storm comes to Japan will depend on the strength and timing of a trough moving out of eastern China this weekend. 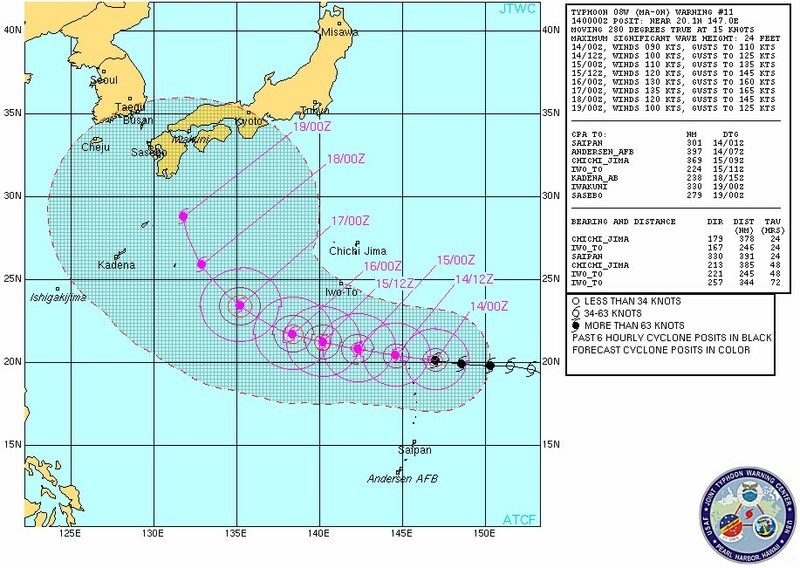 At any rate this storm is something that residents in Japan should watch closely. Satellite image from July 12, 2011 of eastern Asia and the western Pacific. 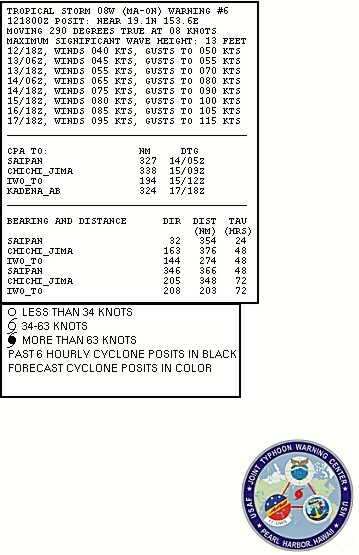 Intensity forecast from the Joint Typhoon Warning Center for Tropical Storm 08W. The build up and anticipation of an upcoming storm chasing season usually inspires numerous blog posts by chasers (including myself), offering a wide variety of topics. Then throughout the months of March, April, May and even parts of June pictures and videos of supercells and tornadoes can be found all over the internet. Websites like Facebook, YouTube, Stormtrack and various other social media sites become flooded with amazing photos and videos of tornadoes from hundreds of storm chasers across the country. With this brings plenty of colorful topics for a storm chasing blog to choose from and expand upon. Then when the chaser heads out to the Plains for his or her own storm chasing vacation, the chaser is able to share the experience with his or her blog readers. Unfortunately, that time has passed us by for the year. The hot summer temperatures have been making a mark over much of the southern and central Plains for weeks now. Supercell and tornado opportunities still exist, but much further north across the Dakotas with a decreasing frequency as we head deeper into summer. While some storm chasers have the time to venture out and continue chasing throughout the summer months, this chaser does not. As a result, many weather enthusiasts begin switching gears from supercells and tornadoes to tropical storms and hurricanes. After all, we are approaching mid July and are now only about a month away from the beginning of the peak Atlantic hurricane season. As we wait for the meat of the season to arrive, we can look across the Pacific for storms as well. But alas we are well past the peak of the storm chasing season across the Great Plains of the U.S. For many storm chasers it’s pretty tough to accept the fact that the season is over, and another year separates them from the next chase. And while there is always the chance for a random spot chase here or there depending on the weather pattern, where you live, your financial situation, your job and your family life (lots of potential obstacles! ), the point is the next time you can chase for several days or weeks without interruption is probably the spring of 2012. So maybe the only point of this post — if any — is to bring to the surface the reality that faces most storm chasers right now, and that’s the post chase season redux. If you don’t fit into this stereotype, then you are a member of the elite few and the envy of many chasers! I require you to share your secrets in the comments section.